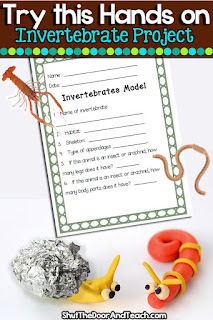 Shut the Door and Teach: Classifying Invertebrates, "Playing" with Clay! With state testing over here in Massachusetts, I feel like a weight has been lifted. Sure, I still have nearly a whole month left with my fourth graders (and reading all over the teacher-blogosphere about people who are out already) but at least now I feel like I can just relax and enjoy my class a bit more. And the way I do that without actually losing them for the last several weeks is to allocate extra time to the content areas! Math and ELA, you get to take a back seat for now. Make way for some science! 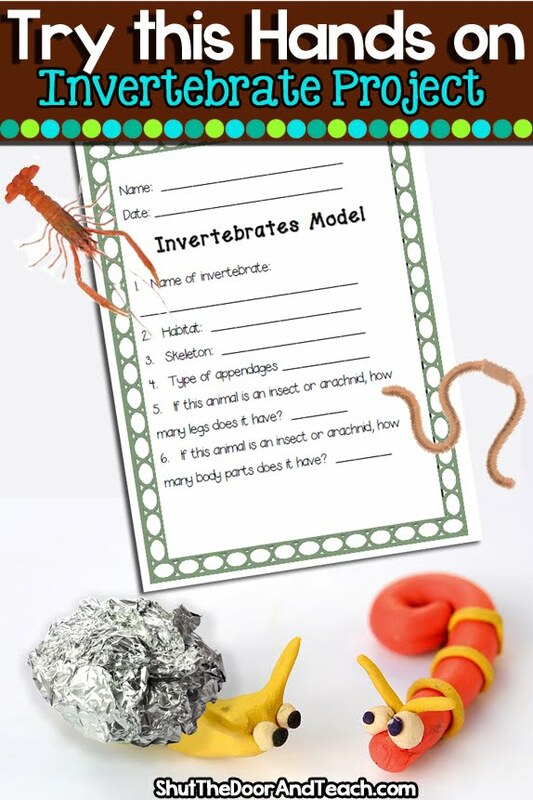 After our unit on vertebrates (which I blogged about yesterday) I delved into our unit on invertebrates. Although our book reverses the order, I think it's better to start with the familiar. And I'm sure kids have more experience with our furry friends the mammals than they do with sea sponges. Plus I enjoy getting questions from those deep thinkers who ask, as we are classifying animals into five categories, "What about ants. Aren't they animals?" It leads to great discussions when it comes time to rationalize why a sponge is an animal! 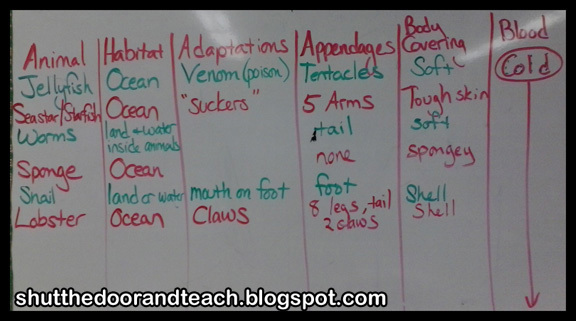 We start out as we did with the vertebrates, by classifying animals by their body covering. 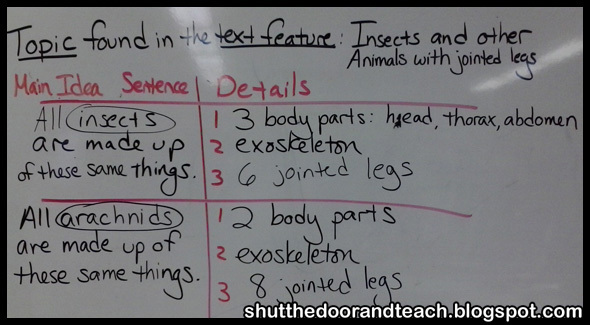 That is, they learn about animals with and without an exoskeleton. To drive the point home, we use CLAY!! The exoskeleton is represented with tin foil. It's not the easiest fine motor task, but of course the activity can be differentiated by assigning certain kids the worm. They feel successful while the kids who like a challenge work with me on how to manipulate the foil. 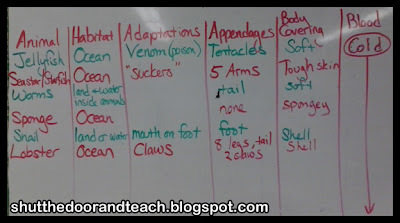 We did further research on key traits of various invertebrates on a scope and sequence chart (below). Next I reinforced the concept of the T chart with kids. 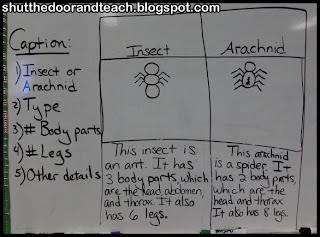 They were learning about how to compare and contrast in reading, and that was a perfect segue into how insects and arachnids are similar and different. Then finally we honed in on how to classify 2 types of invertebrates, insects and arachnids (below). 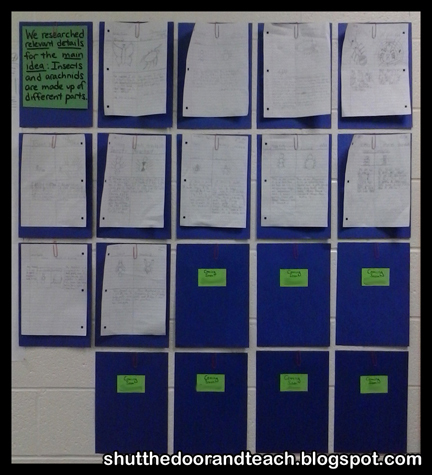 They used the T charts to create captioned pictures for our hall display (Top tip: Use paperclips to easily change out papers throughout the year! Although it worked better with 2 clips, not one center one because they droop over time). 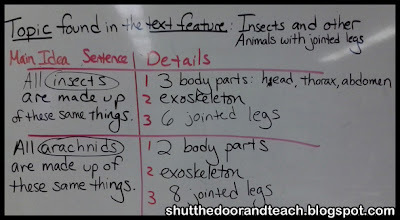 The kids have fun with our animal units, and although Common Core likes to take credit for weaving writing throughout the content areas, it's something I've been doing since I've started teaching (don't we all?). 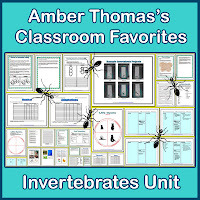 If you're interested in this unit, I have my invertebrates unit available as a complete package deal in my TPT store. Nice! 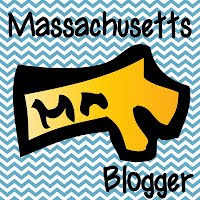 Saw your post on All Things Upper Elementary, and hopped over to your blog to become your newest follower. I felt the same way this year (and last year, and the year before that...) when I looked in the grade book at Science. Found this site while over at ATUE. Curious as to why you have a separate blog? I have just followed this one as I enjoy hearing what you are doing with your students. ATUE began less than 6 months ago. The group of us there share more than just a blog; we Email each other all the time with blogging tips, teaching deals we come across, good news, and bad news. I love our group, and I feel like we've all grown as bloggers because we're all learning from each other. 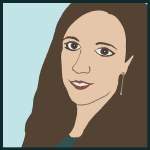 However I have no plans to abandon my own blog here, either. :) It's good to have creative control sometimes as well as collaborate with others sometimes.